Using a measuring tape, wrap it around your waist where you'd like the top of your kilt to sit. Don't hold in your stomach!. Usually this measurement is larger than the waist-size of your pants. You might consider giving yourself an extra inch, or so, for comfort. That will be the ideal waist measurement to order. Remember, it will be easier for YOU to adjust one that's a little too large, but one that's too small might be a job for Slim Fast. Our famous Ultimate Kilt now available in Rare Scottish Tartans! Made to order to the specs you provide, we recommend using a measuring tape to find your true size. Comes with sewn down pleats, and extra stitching along the knife edge all the way down to the bottom hem. Please measure carefully, as we cannot accept returns on custom made garments. I’m outstandingly pleased with this kilt. The construction is excellent – made to measure, so it fits better than the already-pretty-good Sportkilt standard sizing. The pleating (to the stripe) is perfect across the rear, and the sewn pleats hold the profile nicely. The pattern is vibrant and saturated (I went for Buchanan Muted MacGregor Hastie Variant); not as bright in wool as it would be on a synthetic fabric, which in this case is good. It’s bold but not loud. 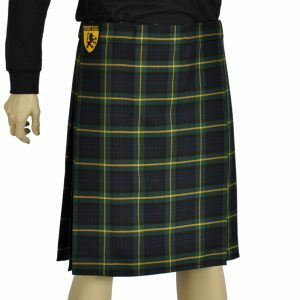 The material is heavier and warmer than a standard Sportkilt, but not as bulky as a traditional 8-yard kilt, so it should work well for a multitude of applications. I don’t expect to wear it for athletic activity other than curling – for anything sweaty, I’ll use my standard Sportkilt in Hawaii state tartan – but the quality of this kilt has me looking for excuses to break it out between now and next Burns Night. As a top-to-bottom custom kilt, this took a little extra time to deliver, but it was well worth the wait. This is a very nice, well-constructed, affordable kilt. It fits perfectly, maintains its crisp pleats, and looks sharp.